The TDM Community is thanked for steady supply of excellent mapping advice. Thanks goes also to everyone contributing to TDM! Special Thanks to: Springheel and Melan (for proofreading). Read & listen it in game. Could someone put this on TDM ingame downloader? Thanks! Edited by Oldjim, 28 May 2015 - 05:04 PM. Congrats! the next FM from Sotha!! Congrats on the release. Will play asap. That would be moi and done. Good work! I was just playing the first Ulysses today, so good timing for me too. Edited by Oldjim, 28 May 2015 - 05:10 PM. Congratulations on the release, I've just downloaded it and I am eager to play! I tipped them down the abbot's toilet and the sewer grate in the church, so far. My one knockout I pushed into a shadowed spot where only a mask seemed to go, after killing the mask. I really enjoyed the story you were telling here, it was very fun to not only do a normal thief mission but to add in the assassinations made it really fun too. I played on hard so I had to kill the plaguemasks but avoid the peasants which made it all the more interesting. I found that the narration I did for you come out as very very loud on my end, I turned down the narration slider in my sound menu but it still was a bit jarring and in your face when it happened. Also I caught a couple of audioble breathes in the narration video that I must have forgot to edit out but I think it turned out well overall! I managed to get the head honcho knocked out with a gas arrow and threw him down into that sewer/pipe sort of thing in the church and then threw a mine on him haha, it was a big send off but felt good! After reading the note and finding out their intention there and seeing the poor builder guards slaughtered I thought it was appropriate. I really loved the layout of the place, not too complicated but not too easy either. A nice balance and plenty of free roaming, whether going through the back door, front door or the vents on the top. When I saw that I could access the building through the vents and saw/heard the fan it put a smile on my face, i've always enjoyed entering via the vents. I finished the mission in just under 50 minutes and collected almost all of the loot, I agree with your statement that the one hour mark is a good time to cut things off and so your mission had great timing in that sense. Once again, thanks for the mission! edit: oh and I forgot to include I really enjoyed the mechanic where you have to kill the plague-masked AI without notifying it otherwise it would kill the hostage, I thought that was very well done! Edited by Goldwell, 28 May 2015 - 07:07 PM. @Everyone great that you find the mission fun! Will we see a U3? Besides that, congratulations on your next release! I'm very curious about your next masterpiece! Completed still on the hardest setting and this time no alerts - mind you I had no water arrows left having washed out all the blood stains. Playing right now and all is great exept one thing.Ghosting(or limited knockouts)should be optional.In this mission it makes no sense for objective "no unnesecary violence" because both peasants and plague mask people do the same thing(atacking the monastery). I disagree, as the motives of the attacking factions are different. Fortunately, those who dislike such objectives can always play on the easier difficulty level. There is candy for everyone. The story was told in an interesting way, and especially the voice acting was well done. I also liked the intro video, although the font was a bit blurred. However, there were some spelling errors in the briefing video. What I did not like that much was the reaction on the letter you get from the leader of the masked squad. It appeared a bit exxagerated to me. While it may fit the character, it made it a bit hard for me to indentify myself with the person I am playing. Overall I think the story was interesting and athmospheric, with some minor issues so I would rate this a 4/5. The mission looked good as always. You are mapping at a very high level. However, I think the mission is lacking some visual highlights. The inner yard was a bit empty for my feelings, some more flowers or other plants would have been nice here. This is always the most important part for me. The idea and implementation of the hostage situation was pretty nice, and assasinating the masked guys without getting detected was definetely something different. All hostages were placed in logical situations and the level of difficulty caused by the amount of guards and the lighting felt right for me. I've played under the highest difficulty and was able to fulfill all objectives. There are some minor issues, though. The ai didn't respond to the blood trails, although they were in bright light. Increasing the chance of them noticing them (maybe even setting it to one houndret percent) would have made thinks more interesting here. In addition there is way too much equipment. I only used two water arrows, a mine and a broadhead (over and over again). Under the highest difficulty the player should be forced to use his equipment very wisely imho, which isn't neccessary here. I liked the air shaft in the starting area allowing me to enter the monastery silently. You could have used this much more, as it is always a nice way of bypassing guards. So this was definetely an interesting and tensive experience, with some possibilities for slight improvements. I rate this a 4/5. 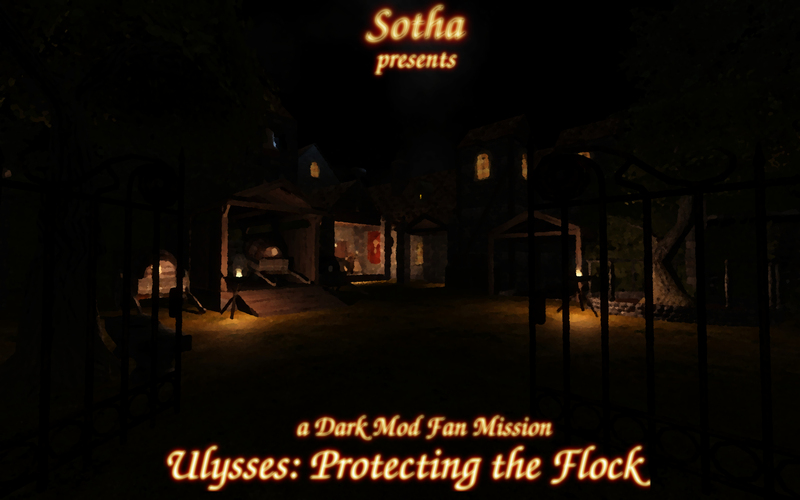 This mission is definetely worth playing, and I can't wait to play the next part in your Ulysses series. Keep up the good work and thanks for the time you've invested into this mission (and all your others before). Edited by Cookie, 31 May 2015 - 06:43 AM. The leader has a scroll on him. Really nice mission, not as good as the masterpiece Ulysses 1 (which is the second best Thief style mission I have ever played, only behind Life of the Party in my opinion), but still really really good. Edited by Cookie, 31 May 2015 - 09:59 AM. Wow! That sounds like a very high stature for a mission. Thank you. I'm very happy that my missions have been so enjoyable! I'll keep doing my best in the future, too. .Also my zealous protagonist is great with his actions and voice acting! I cannot wait to see your next mission. And sorry for my bad english. Edited by lowenz, 01 June 2015 - 06:33 AM. 1) Mapping occurs in orthoview. It is very easy to get stuck in two-dimensional mindscape. This happens to me very often, and also for other authors, too. Generally, our maps are quite flat. 2) Allowing access to high areas makes a lot of stuff more complicated: suddenly you need a killer skybox that looks good, suddenly you need have the player to be able to see to the next visleaf from above. This is more work and bad for the performance. I was keen to get the mission completed and have it perform well. 3) The bell tower would have needed some kind of purpose and a reason to be built. I was more interested in fleshing out other locations. I like it when missions have a good focus. A trench warfare analogue: spreading your front over long distance makes it very thin and weak. I like to focus on key strongpoints and do them well. This may be one ingredient in my missions that folks find appealing.